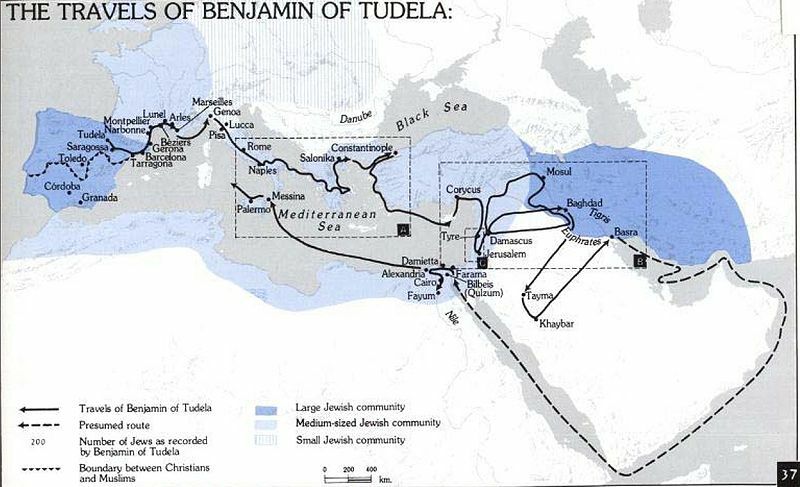 Benjamin of Tudela was a 12th-century Jewish merchant from, predictably, the Spanish town of Tudela. Though only a layman, he was well versed in Hebrew, Arabic and Spanish (likely basic French as well) and was familiar with the leading Jewish poets, scholars and physicians of his day. He wore his piety lightly in the manner of Iberian Jewry, but his love for the land of Israel was a constant goad to his traveling urge, which took him as far east as Babylonia, and back to Spain. In recent issues, Moment has written about Narbonne, a southern French city once home to a thriving “Jewish kingdom,” and medieval Cairo. Benjamin of Tudela traveled to both cities on his cross-continental journey. When I confided to a friend I was considering reviewing The Itinerary of Benjamin of Tudela, a first-hand account of the voyage, his interest was piqued. But my friend was also uncertain. Why critique a book written almost 1,000 years ago and hardly read today? The answer is revealed in Benjamin’s extensive, illuminating travels, when he met a flurry of Jewish characters, from the Iberian Peninsula to the Orient, a veritable who’s who of medieval Jewish history. After visiting France, Benjamin continued to Italy, where he demonstrated his grasp of Jewish culture, especially the great medieval scholar Abraham ibn Ezra. In Salerno, he met a student of ibn Ezra, now seen as the first voice of what would become modern biblical criticism and one of the three great poets of the period, along with Solomon ibn Gabirol and Yehuda Halevi. Benjamin praises the student’s “very clear and truly beautiful Hebrew,” which he attributes to ibn Ezra’s pedagogy. Benjamin’s travelogue also abounds with references to raging disputes between the Rabbanites and the Karaites, two sects with warring views of what constituted true Judaism. The Karaites, who, in contrast to the Rabbanites, believe in the preeminence of the Tanach, then loomed large across the eastern Mediterranean, in Constantinople, Cyprus, Antioch and Palestine. Only a few thousand remain today. It is fascinating to feel the pulse in Benjamin’s letters of what was then a living faith. “Karaites, Vlachi, Khazars, Kaphrossin, Samaritans. The closer I get to Jerusalem, the more of the Jews are heretics,” Benjamin quips in a letter from Nablus. After leaving Palestine, Benjamin traveled to Damascus. 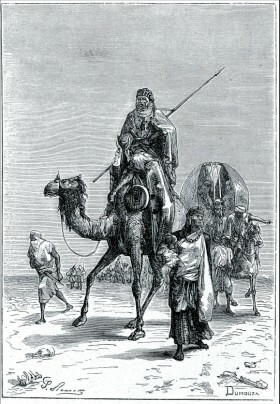 Whereas “the air was heavy for me in Christian-ruled Jerusalem,” he writes, “I feel more comfortable now that I am again in this lush and Moslem land.” The sentiment strikes a strange tone today, but Benjamin would have been at ease in the Muslim world, which accommodated Jews from Baghdad to Cordoba. In Baghdad he visited two famed rabbinical academies to which modern Orthodoxy is indebted, Sura and Pumbedita. He then turned westward, stopping in Cairo, where he encountered a dwindling population in the original Jewish settlement of Fustat. “Some wealthy families have abandoned Fustat completely,” he observes. Fustat’s remaining Jews were not so rich, but “they are not poor either.” However, Benjamin makes it clear that the new Jewish neighborhoods in Cairo are “cleaner and more elegant.” His observations shine a light on an Egyptian past that was inclusive of a Jewish community, which is hardly imaginable today. Benjamin’s last stop was Sicily. There he found Christian rule surmounting what had been years of Muslim sovereignty. For Benjamin, Messina “still sounds and behaves as though it were a Mohammaden city,” a compliment, no doubt. He describes an island of many riches in which Christians, Muslims and Jews freely celebrated their respective religions, a situation that would change radicallyby the 15th century. Benjamin ends with a prayer for the return and the ingathering, a sentiment we still warmly endorse today. Harold Ticktin has written for Midstream and Jewish Currents. He writes a weekly column on Yiddish in the Cleveland Jewish News. He lives in Cleveland. I have searched several versions of the Travels of Benjamin of Tudela (English and Hebrew) and have not found this quote or any reference to Maimonides. Please let me know what edition you have seen this.